Many Americans don’t know Trevor Noah nearly as well as most South Africans, who over the years have seen him rise through the ranks of comedians to become a South African icon. No one does accents as well as Trevor Noah does, and no country like South Africa gives you so much good material for them. But perhaps even most South Africans don’t know much about Noah’s past. He was “Born a Crime,” which is also the title of his newly-released memoir, grew up in poverty, and suffered from bullying and domestic abuse. Raised by a fiercely independent single mother, he flitted between Soweto, Alexandra, and a handful of other Johannesburg suburbs throughout his childhood and adolescence, never far away from the next disaster. To think that he is now the host of The Daily Show where we could recently watch him interview an American President seems utterly impossible given his humble beginnings. I have been to Alexandra, I have been to Soweto, and I have seen the daily struggles of the vast majority of people living there. Trevor Noah’s improbable walk out of an African township and right into the halls of power (or, if not power itself, then the power by proxy of wielding influence over hearts and minds) surely must be one of the most inspiring stories of our time. But it’s also a hugely entertaining story, and this brings me to the rest of this blog post, my review of Born a Crime: Stories from a South African Childhood. 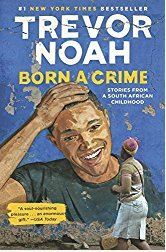 Whether you have any connection to South Africa, love Trevor Noah, or simply like reading a good memoir, Born a Crime should be on your shortlist. More specifically, you should get it on Audible – Noah narrates the story himself, and it is a luxury to listen to his voice outside of my nightly dose of The Daily Show. As the title suggests, at the center of Trevor Noah’s personal story lies the fact that his birth constituted a crime in then-Apartheid South Africa. At the time, interracial marriage or intimate relations were forbidden, and when his African mother became pregnant as a result of her relationship with a Swiss businessman she met in Johannesburg, both had to go to great lengths to hide the outcome of their crime, only meeting behind closed doors or walking apart when out in public. As a result of his parents never marrying or even living together, Noah was raised by his mother, who herself was an outsider of sorts among her own people, the Xhosa. Far from turning Noah into a person who is bitter at the world he grew up in, his unique childhood instilled in him an intense curiosity and ability to fit in with a wide range of vastly different and separate groups like a chameleon, as he repeatedly calls himself. His unique ability with languages helped him greatly. When he lived among his black cousins in Soweto, he conversed in Xhosa and felt black, just like them. When he attended a private primary school after the end of Apartheid where kids of various backgrounds came together, he felt equally at ease with the white kids, due to his flawless upper-class South African English. As he points out at the beginning of the book, South Africa has 11 official languages – written into its constitution post-Apartheid so as not to offend anyone – and he learned to speak many of them, sometimes without even being aware that he did. In his mind, all the conversations occurred in English, he says at some point. Curiously, the racial group he felt least welcomed by were South Africa’s Coloureds, even though he looked the most like them as a mixed-race child. Fiercely protective of their cultural history and status (above blacks, but below whites) in an Apartheid regime whose goal it was to put a wedge between racial groups, as he explains it, he was considered a traitor rather than one of them. A traitor, because instead of Afrikaans, he spoke the language of their rivals. I have found this to be very true after years of living as an expat. It is so very easy to dismiss people who speak little English, or heavily accented English, as inferior and uneducated. English is not just the language of business, it is also very much the language of culture and learning. If you’re black and speak English badly, you immediately invoke a lot of prejudice in white people. If you’re black and not only speak English fluently but do so with the perfect accent appropriate to the group you find yourself in, you become one of them. Suddenly, through the lens of language, they see you as white. Noah doesn’t mince words. He is very critical of racism and the way South Africa’s government institutionalized it through Apartheid, and also of the more subtle forms of white privilege still persistent today. When you grow up black and poor, he says, you are told that you need to just work hard to make something of yourself. But no one gives you any of the tools you need for it, or even tells you what the tools are. Another question he spends some time exploring is this: What does it mean to be a criminal? Where exactly are the lines between right and wrong? On the streets of Alexandra, he says, there is a definite honor code. It’s not lawless. But what our Western worldview considers to be criminal behavior, like selling bootlegged music or peddling goods you know had to be stolen, is not seen the same way when you grow up in abject poverty. Stealing from whites is often justified with a simple truth: Whites, his township friends tell him when he voices his qualms, have insurance. Miraculously, they get back what is taken from them. Because township life is so removed from the lives of the privileged, it’s easy to grow up without feeling remorseful when all you’re trying to do is get by day to day. I’ve alluded to this in previous musings about corruption in the context of culture, and found it hard to hit the right tone between thoughtful and condescending. Noah does a good job explaining what I meant to say. But his main gift is to humanize the environment he grew up in with wonderful tales of his childhood and adolescence. His mother is a truly fearsome person who insisted on building his character with whatever means she deemed necessary, even if it meant letting him linger in jail when he got himself into a mess, or dragging him on endless missions through the dangerous streets of Johannesburg to attend Sunday church – not once, not twice, but often three times, to pray to Jesus at every possible turn and to cover all the bases. Having lived in South Africa, I felt myself inexorably drawn back into its orbit by Noah’s wonderful storytelling. He captured the spirit of Johannesburg and of the South African psyche perfectly. Many situations he describes were very vivid to me, by virtue of having lived there. His experiences at school sounded very much like those of my kids, even though their backgrounds are very different. Some anecdotes in particular stood out to me: His being thrown, by his mother, from a moving car in order to escape a dangerous situation; his taking a clandestine dump on a piece of newspaper to avoid using the outhouse during a rainstorm; and him hustling pirated music CDs and financial services on the streets of Alexandra after he and his friends have finished high school and find themselves without prospects. These are all great South African stories, and so much more, that you get in “Born a Crime.” For memoir lovers, I’d say it’s a bit like Angela’s Ashes with sunnier weather. As a bonus when you get the Audible version, you get to listen to Trevor Noah unabridged, including his entire repertoire of African accents. If you’re reading this post because you are a soon-to-be expat in South Africa, then get Born a Crime to familiarize yourself with the surroundings. I also encourage you to browse my other book recommendations on the Africa Bookshelf.